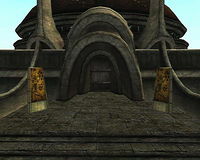 The Palace of Vivec is the abode of the mortal form of the god-hero Lord Vivec, the warrior poet of the three deities who comprise the Almsivi. The Palace is located at the southern end of Vivec. Behind a heavily locked door, Vivec spends his time here overseeing the inner workings of the Tribunal Temple and of Morrowind in general. Only respected visitors are permitted an audience with him, and only at his request. The palace is also the site of the Temple Shrine of Generosity, one of the Seven Graces, and it is customary for travelers to leave a donation of 100 gold pieces. Beneath the Palace Canton lies the Puzzle Canal, a series of mysterious tunnels that hide the Shrine of Courtesy, another stop on the Seven Graces pilgrimages. 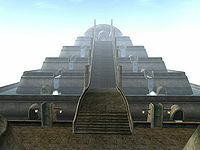 It is a place of worship and testing for questing heroes hoping to receive Vivec's favor. To open the palace door, you need a special key from Archcanon Tholer Saryoni or high Security skill. An Open spell/scroll will not work--the door is immune to unlocking magic. There are four notes on a pedestal behind Vivec: Plan to Defeat Dagoth Ur, The Battle of Red Mountain, Dagoth Ur's Plans, and Nerevar at Red Mountain. This page was last modified on 12 October 2018, at 22:03.